Wood floor moldings are used to cover the expansion area, level height differences between adjacent flooring, hide cut ends and accent the floor. The Stair Nose puts an attractive finish on stairs by integrating exposed floor edges to create a seamless level transition to the floor on every step. Coordinating moldings are available for all Mohawk hardwood flooring. 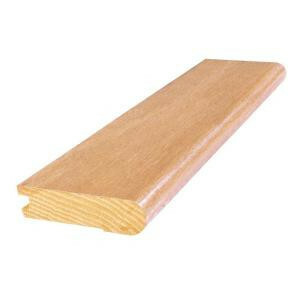 Buy online Mohawk Red Oak Natural 3 in. Wide x 84 in. Length Stair Nose Molding HFSTF-05012, leave review and share Your friends.